A celebration of Tweed, Whiskey, Denim, Accessories and the Traditional Gentleman's Sartorial Lifestyle. A solid pair of well broken-in boots are a thing of beauty. 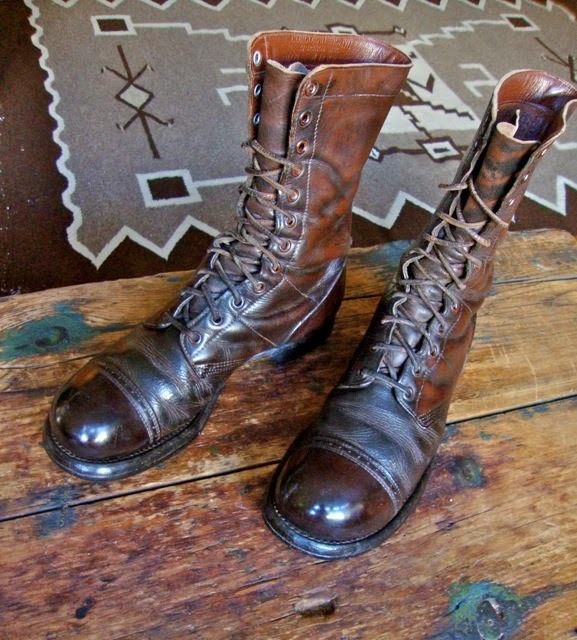 Having discovered a great looking a pair of circa WWII Corcoran jump boots a couple of years ago while cruising Pinterest, led me to a chap's blog post where he was kind enough to detail the process of antiquing a new pair of Corcorans with full photos from start to finish. In April of 2016, I bought a new pair of brown Corcoran Jump boots and decided to give it a go and I've been extremely happy with the results. Unfortunately, this chap's blog either no longer exists or I am too dense to find it again. So, having been asked several times how I accomplish this result, I've decided to detail the process here. Sadly when I Antiqued my boots, I hadn't thought at the time to document the process in photographs, so this blog post will be largely descriptive. Originally these boots were made for US Army WWII service members as paratrooper boots initially in brown and the uniform was later switched to black. 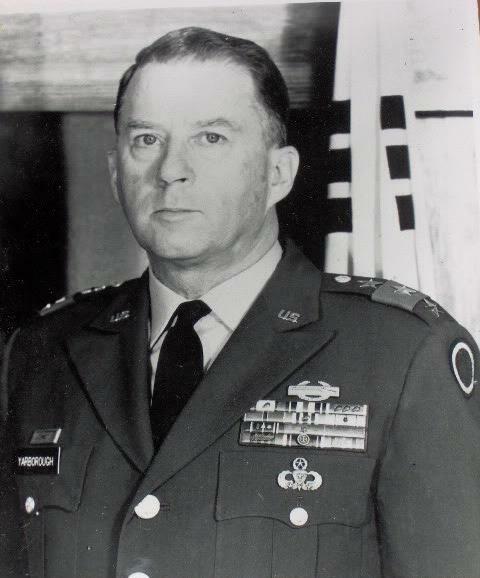 As a personal note, my father was a paratrooper early in his army career (late 1950's and early 1960's with the 82nd Airborne) and I'm sure all the boots I ever saw around the house were black, although by the time I have any memories (the early 1970's), he was no longer a jumper, having wisely switched to being a chopper pilot and I'm sure his at that time would have been the lug-soled combat style boots. Paratrooper jump boots were designed by Lieutenant Colonel Yarborough who also designed the actual Parachutists Jump Wings, the M-1942 Uniform (WWII Paratrooper uniform) and also various other parachute delivery equipment. You can read more about the jump boots here and here. These boots were only worn by Paratrooper who had earned their 'jumper' wings and were considered a right of passage among the troops at that time. Made by Corcoran Boot Company under contract to the US Army, they were (and still are) made from very thick and strong leather uppers which were Goodyear welted to a man-made rubber sole. Interesting, these particular boots are differentiated from standard combat boot by their Ankle reinforcement and lack of a lug sole, which were considered to be a possible hazard to get caught up in the harness and para-cord of the parachute canopy during a jump and so the jump boot version forgoes the lugs (I'm not sure if this story is heretical, but that's what I've read). These fine boots have a long and storied history since World War II and have been made by the Corcoran boot Company to the same design and quality, to my knowledge during all those intervening years. 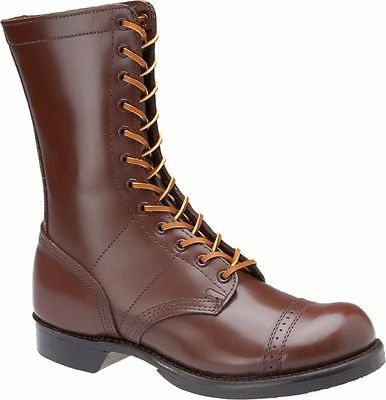 There are a couple of sources for this boots including eBay in both the US and in eBay Germany as well as several reputable Military type stores, which you can easily locate with an on line search. It's important for our purposes that you DO NOT buy a cheaper substitute, as many of these off branded boots are made from extremely inferior leathers and may not withstand the antiquing process that is described below!! These boots fit large and are also wide (mine are 'EE'). The size I bought is US10 and fit very well. I usually wear a size US 11, so I recommend sizing down by one whole size. 1/2 liter of denatured alcohol. Several rags or a roll of paper towels. leather Antiquing gel (Briar brown, Dark Brown or Mahogany). Kiwi Shoe polish in Brown, Cordovan, Tan and Neutral (Neutral Parade gloss works great). Also very important: heavy duty rubber gloves!! 1. After you've made sure the boots fit OK (they're going to be stiff as hell and torture to wear laces all the way up, but don't panic, they'll be broken in by the end) it's time to soak them in a tub of cold water overnight. The next day drain them and let them begin the dry out. 2. When about half dry put them on and wear them around for a day or two in order to break them in and get them to shape to your feet and calves and to achieve those great creases around the ankles. I recommend also while wearing them to do plenty of deep lunges, which with really get those creases around the ankles going. The boots will be quite stiff to start so don't plan on being able to lace them to the top right away and wearing thick socks will help prevent too much discomfort. Then as they start to soften up, lace them up a bit more until you can wear them with not too much discomfort laced to the top and just walk around for a few hours per day. 3. Finally take them off and let them dry completely (away from heat sources). This might take a couple of days. Step 2. Now it's time to strip off that horrible painted on brown finish. For this you will need plenty of rags or a roll of heavy duty paper towels and the denatured alcohol. Wet a wad of paper towels or a rag and get to rubbing. Don't worry about getting every bit of the original finish out of every crease and crevice as this will add to the character of the final boots but do try to get the vast majority off. Then Allow the boots to dry for a couple of hours. Step 3. 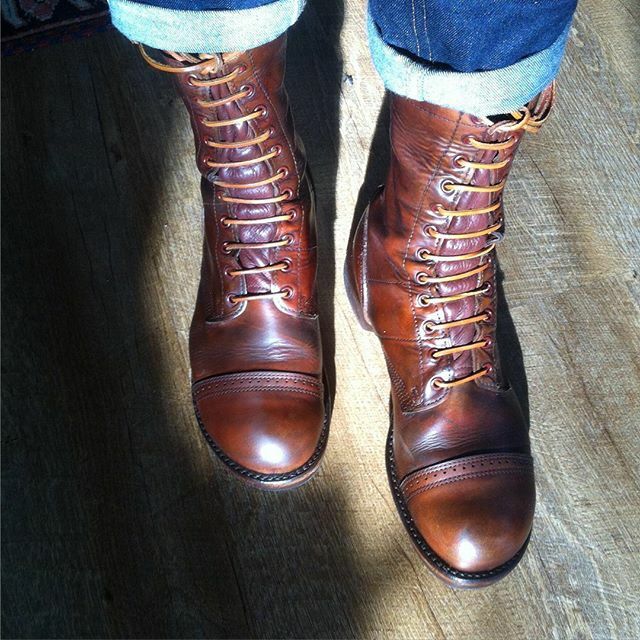 When the boots have been stripped and have dried, treat with the neatsfoot oil. This will recondition and soften the leather and replace any of the oils that were lost through the wetting and molding and stripping process. A couple of applications are probably a good idea. Allow the neatsfoot oil to soak in and dry out for a few hours. Step 4. It's time to being the staining process. This is a mess so don't forget the rubber gloves. Apply a light layer of the Antiquing gel - go easy here and be prepared to wipe off right away - the exposed leather tends to soak this in at a surprising rate and you don't want your boots to get too dark. Your boots should start to look pretty cool at this point. ideally the creases and crevices will keep a bit more of the antiquing. Also, if you'll be using new leather laces like I am, you can run them through a paper towel with the Antiquing gel to give these a vintage look as well. Step 5. It's time to add a bit of the leather dye. Again wearing Rubber Gloves. But before you do, dilute the leather bye by mixing it 1 part Mahogany, 1 part Dark brown and 3 parts denatured alcohol. You won't need much of this - all mixed up probably less than 5 oz total will be more than enough. This will dilute the dye so that the boot will not get too dark. Apply one quick, light coat to the boots with a wadded up rag or paper towels. The color will go on dark but lighten up substantially as the alcohol dries from the leather. One quick application of the leather dye should be enough. Allow to dry for a 1 or 2 hours. if after that you want them a bit darker, apply a second coat and allow to dry. Step 6. Once the leather dye has completely dried. It is now time to begin using the colored shoe polish to achieve your final color. Just use several coats of wax alternating as desired between Kiwi Shoe polish in Brown, Cordovan and Tan, buffing off in between coats of different color until you achieve your desired final color. lastly several coats of the neutral parade Gloss shoe polish as a top coat and to give your a nice gloss. Remember, these are military boots so there is no such thing as too much shine. Enjoy your newly vintage jump boots! To inspire you, here are some photos of my boots as a motivation. To do this, you don't need to be a great leather worker or have any experience, just carefully follow the directions in order and have patience with each step and your jump boot project can turn out great as well!! Really like the shoes. Who is the maker? Nice looking, I had to get the 1500 as they don't make my size in the WW II version. Who is the Landless Gentry? I founded The Landless Gentry blog as an online journal of my exploration of my interests in complete gentleman's lifestyle including traditional Clothing, Accessories, Drink, Travel, and just about anything a modern yet classic gentleman would find of interest. I will expect to share a number of review of products I purchase and love. Please feel free to subscribe to my blog and come along on the journey and comment freely! Spencer's Trousers - Made to Measure! Darcy Clothing - Great for traditional men's clothing! 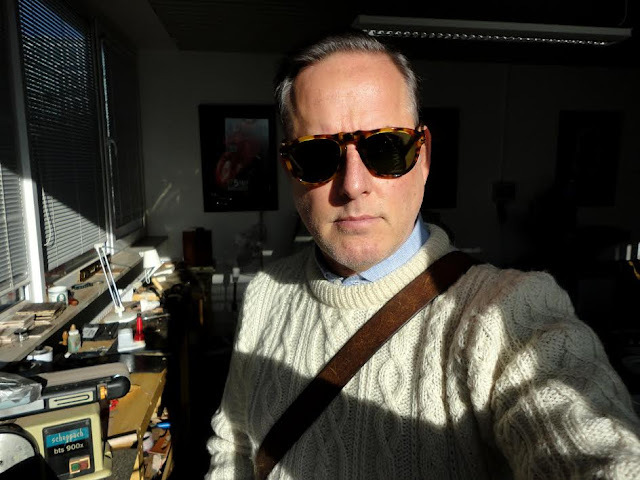 Review: Duffle Coat from John Partridge Co.
All content of the Landless Gentry is Copyrighted. Please don't use without attribution . Simple theme. Powered by Blogger.